So here’s the problem. I want a changing bag. I want one that has enough pockets to put bottles, nappies, toys, keys, hats, sun cream etc. I want one that looks good and is very ‘me’ (I have a boy, it’s one of the few things that can be cute and a little girly). I don’t want to spend a ridiculous amount of money. The solution? I decided to make my own. I like a challenge, so why make one from a pattern that already exists, especially as I already had a pattern for a bag that I wanted to make. 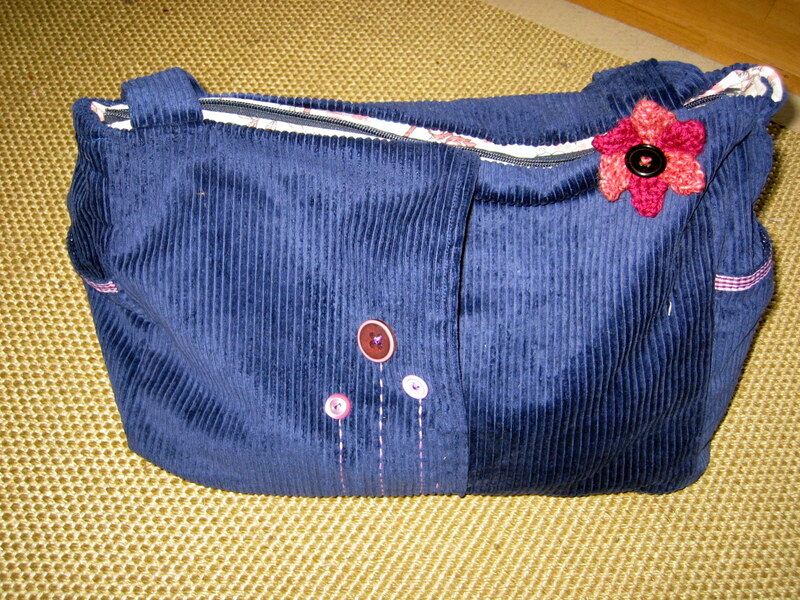 I love a book by Lotta Jansdotter called Simple Sewing and had already made a few things from it. This bag (the brown one on the left) I’d seen and thought I’d like to make it so when I needed a changing bag, I found the perfect excuse! This bag is slightly bigger than an A4 pad of paper, has short handles, one side pocket and a front, hidden pocket (if you look carefully you can see the white line that goes up next to the embroidered flower). I decided to make it out of an old pair of trousers which adds some really interesting lines and textures (you can’t quite see it one this picture but I had to keep a lot of the original seams). 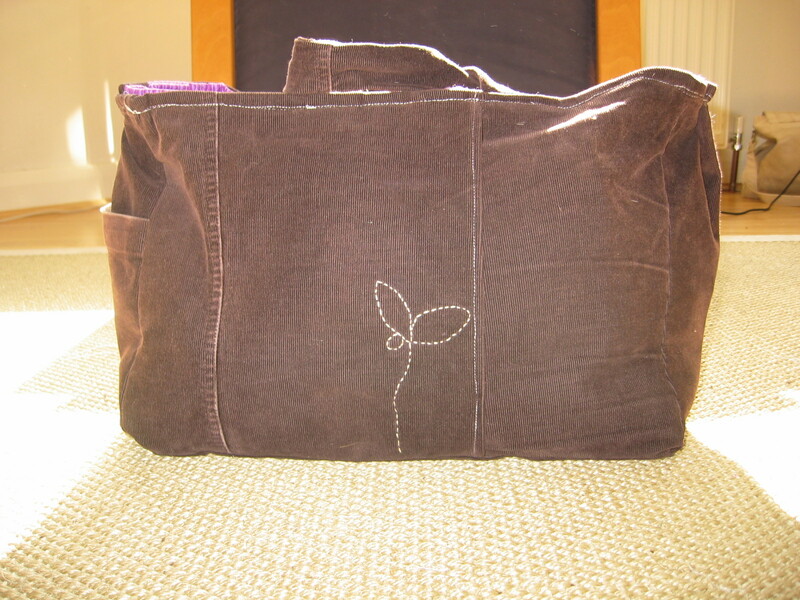 Good as it is (and I love using it), it isn’t quite right for a changing bag. I decided to make some changes, make it larger, make the handles a lot longer. I added a zip and an extra pocket on the other side of the bag. The pockets on either side of the bag are the perfect size for bottles. The hidden pocket in the front, mostly holds mussies. The main changes I made though were to the inside. 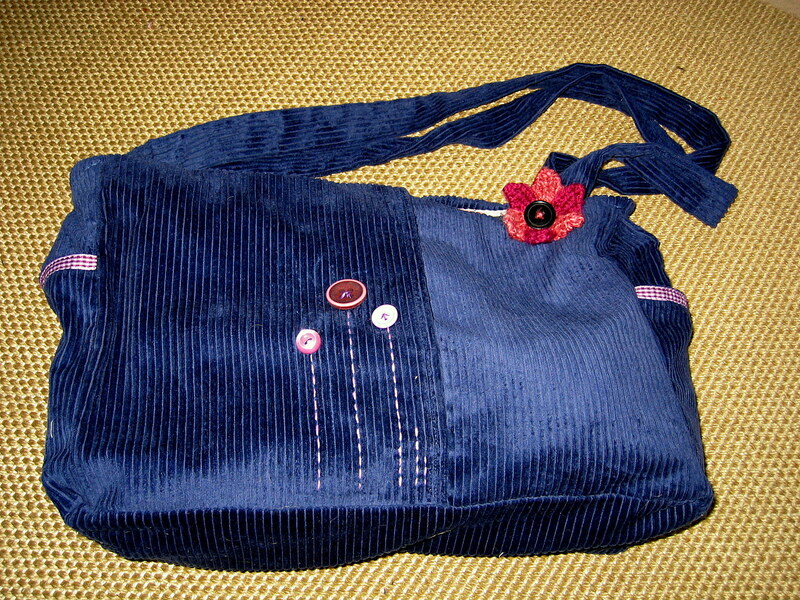 On the original pattern there were smallish pockets for your mobile phone, keys etc. Well I love pockets, especially big ones that you can lose your kitchen sink in. I put two large pockets on one side of the bag and a hidden pocket in the other. They are very useful for putting toys and my changing mat in. 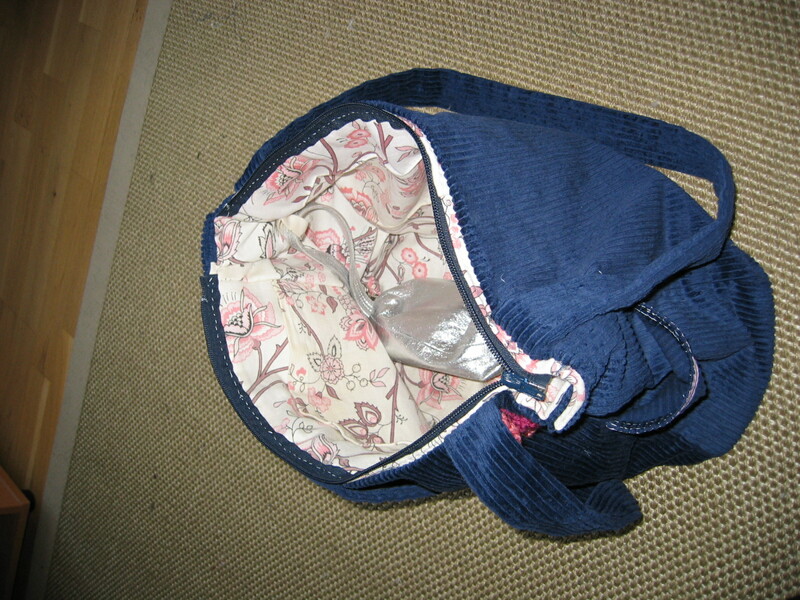 I also added a loop to the inside so that I could attach a small bag (I am awful at losing keys and phone, so in a large bag, a small bag with these are is very useful). Finally, I chose to use Corduroy fabric for the outside and some vintage curtain fabric. These fabrics are very strong which means that even when the bag is full, it can hang off the back of the buggy. They are also washable so if it gets dirty, I just throw it into the wash! 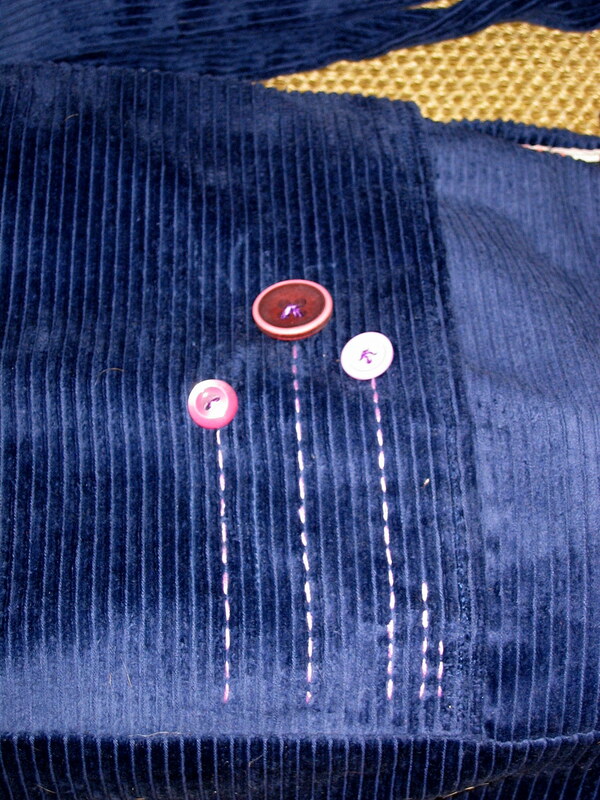 I added some ribbon to the outside side pockets and sewed some button flowers onto the front. All in all I’m very pleased with it. It’s actually a very simple pattern and only took one afternoon to do.